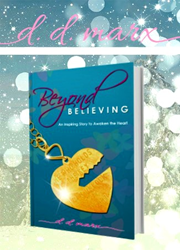 Whether looking for a stocking stuffer for a loved one, a gift exchange with gals, or a story to accompany some hot cocoa, Beyond Believing acts as the perfect holiday companion for anyone looking to smile this season! D.D. Marx is a contemporary romantic fiction writer and blogger, as well as a lover of all things social. She is a graduate of the University of Dayton, as well as the Second City program in Chicago, where she currently resides. A proud aunt and self-described hopeless romantic, Marx has always had a knack for humorous and engaging storytelling. Her pen name is a dedication to her beloved friend Dan, who continues to guide and inspire her in her daily life. For more ways to connect with D.D. check out ddmarx(dot)com and be sure to check out her media page where you can find her latest and greatest interviews/events!